It’s of course a unique setting for a hotel and it’s not really in walking distance to anything but the ski hall, but for that it is really convenient and also just for a weekend away. This is a great hotel for families with kids. We especially appreciated the play room in the restaurant, but also the fact that there was a kids buffet for New Year’s Eve. The breakfast was good and the room was comfortable, also in size, with plenty of storage space. Sole purpose was to ski so having accommodation within the complex was perfect. There was plenty of parking, and the elevator worked well. Very good service , good souna, very friendly staff. The place has everything you need and the staff are always friendly and helpfull. Having all the facilities on hand is good and shops are not to far away if you want to get out. I would recommend it for a sharpener for the ski season. The room was great, very comfortable. Some staff very helpful. The food was good particularly the cafe/bar area. Facilities well thought out and access to the ski dome all really easy. Great fitness location. Good breakfast and comfortable, modern rooms. Very good food at restaurant, self-service restaurant is also very good. Chocolate fondue :) Weizen beer of local brewery is great! Direct access to ski-piste, sauna, ski-school.. We had everything we need on-site to make it a great weekend. Hotel SnowWorld This rating is a reflection of how the property compares to the industry standard when it comes to price, facilities and services available. It's based on a self-evaluation by the property. Use this rating to help choose your stay! The hotel rooms are decorated in a contemporary style with comfortable beds and a private bathroom. Air conditioning is available in all rooms. Experience the tasty dishes which are served in one of the three restaurants. Choose from a self services restaurant, fondue or à la carte dinner. Drinks and snacks are available in the two inviting bars. Experience some après-ski coziness here. When tired after a day in the snow, visit Hotel SnowWorld's wellness center with a sauna, solarium and relaxing room. There is also a beauty center in which guests can enjoy different beauty treatments. For a nice view over the green surroundings, sit out on the terrace and experience the attractive setting of this hotel. Skiing classes for all levels can be arranged by the hotel. Centrally located between Heerlen and Kerkrade, the hotel is just 9.3 miles away from beautiful Maastricht and 6.2 miles away from Aachen, just over the German border. When would you like to stay at Hotel SnowWorld? 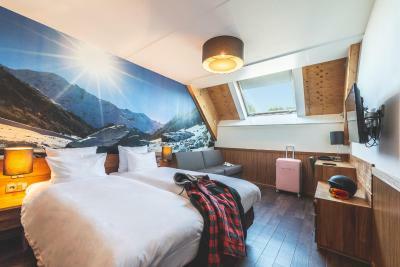 This room features chalet-style touches including a wood panel wall and special photo wallpaper. It includes a modern bathroom, flat-screen TV and air conditioning. This room is more spacious than the Comfort Room. It is equipped with a separate shower and toilet. This winter-themed split level suite has a wooden paneled wall and special photo wallpaper. It includes a modern bathroom, flat-screen TV and air conditioning. It also comes with a roof terrace. House Rules Hotel SnowWorld takes special requests – add in the next step! ATM card Hotel SnowWorld accepts these cards and reserves the right to temporarily hold an amount prior to arrival. Hotel SnowWorld accepts these cards and reserves the right to temporarily hold an amount prior to arrival. Children 4-12 years old are € 15,00 per child, per night. The maximum capacity of the room cannot be exceeded. Tea and coffee making facilities in the room please ! Where was the kettle...? A bit more information about the ski passes would of been helpful and you have to reserve your place for dinner with the bbq on a table restaurant as they only cater for a certain amount. Overall it’s a very good ski venue. The rooms are clean, the beds are comfortable and modern. We had excellent food morning and evening, the staff are very welcoming when we arrived and throughout the whole stay. The skiing is amazing, what we wanted and some more. Things were a bit pricey, but manageable. I did notice the shortage on staff too, but then again they all did a fantastic job and they all spoke English, which helped when you don’t know the native language 😄. The room was perfect for a base, especially when it comes to skiing as that’s what you do most of time. I shared with a good friend and it worked for us. I visited the very functional gym, better then the one at home in the UK! The food was nice, and from what I experienced the staff were friendly too. So for a 3 day trip, it was perfect. In all honesty I would of loved to stay longer. Heating didn’t work so we froze. Glass toilet door. Room is cold. Restaurant staff is frosty. WiFi connection is really bad, it’s very slow and sometimes even no WiFi in the room. Car patking is easy and secure. 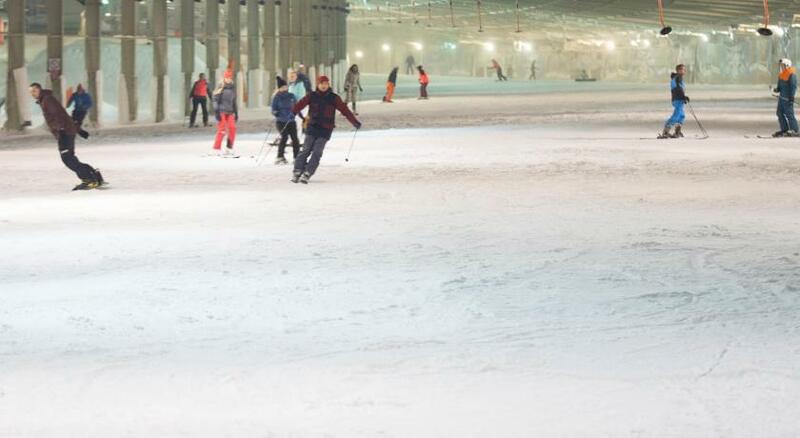 Indoor skiing is cool also has outdoor playground with different facilities for adults and kids. corridors outside rooms need repainting/maintenance, probably people with ski boots don't care much. Indook ski slope, excellent breakfast, comfortable bed ! I was told that we couldn’t get the special rates for skiing because we didn’r book with the company itself. Therefore we had to buy skipasses every day without any discount..
Room, restaurants, food, slopes. Recepcionist was helpful and very kind.